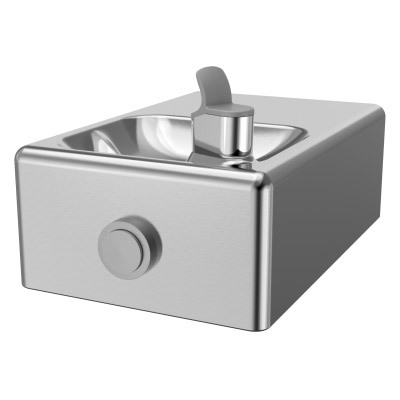 The Sunroc DF-3401 Drinking Fountain is a non-refrigerated stainless steel drinking fountain for direct connection to a cold water supply or for use with remote water chillers. Single mechanical push-button on cabinet front keeps water flowing while button is depressed. Unit extends 19 inches from wall with bottom plate for easy access by wheelchair users. When the fountain is properly installed, it allows your facility to comply with ADA requirements. These Water Coolers comply with the requirements of A.D.A. (Americans with Disabilities Act) when properly installed. Also meets the guidelines for children’s environments providing the floor to orifice height is 30" or less and proper clear floor space is provided for parallel approach. (Based on Architectural and Transportation Barriers Compliance Board final ruling.) Check Local and State Codes. Built-in Pressure Regulator Assures Smooth, Steady Water Flow.